Riad Lahboul Location. 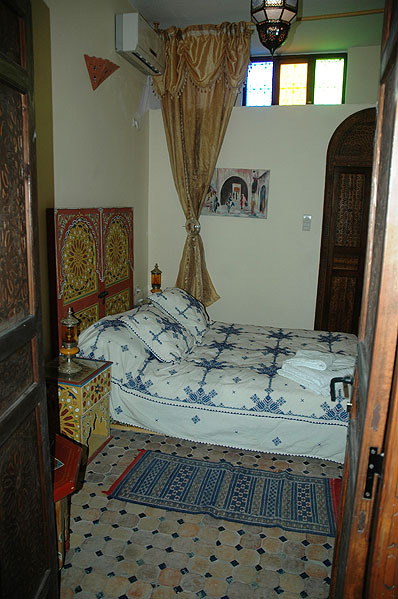 Book Riad Lahboul Today with Hip Morocco - Holiday Accommodation in Fez, Morocco. 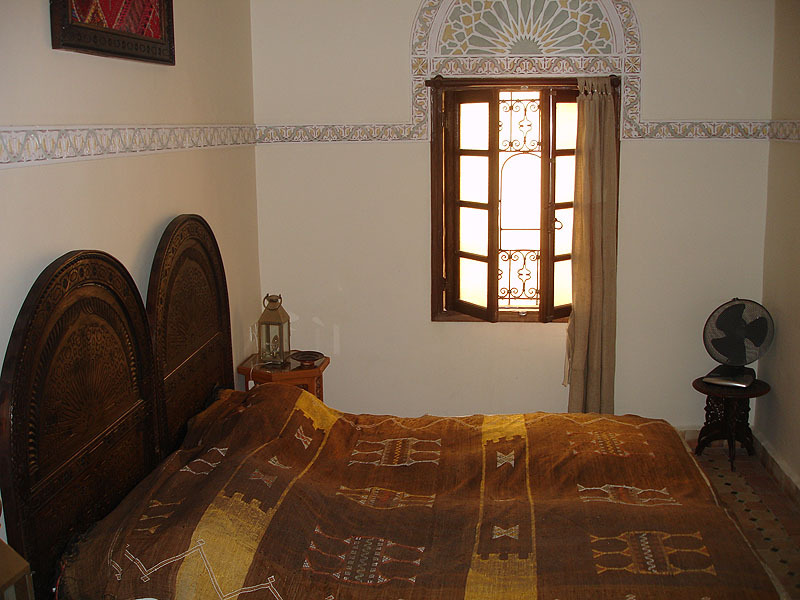 "Atmosphere, sights, sounds and smells you’d hope to find on your Moroccan adventure"
Riad Lahboul is a traditional Moroccan guest house in Meknes, about 60 minutes drive from Fez, and 2.5 hours from Casablanca. 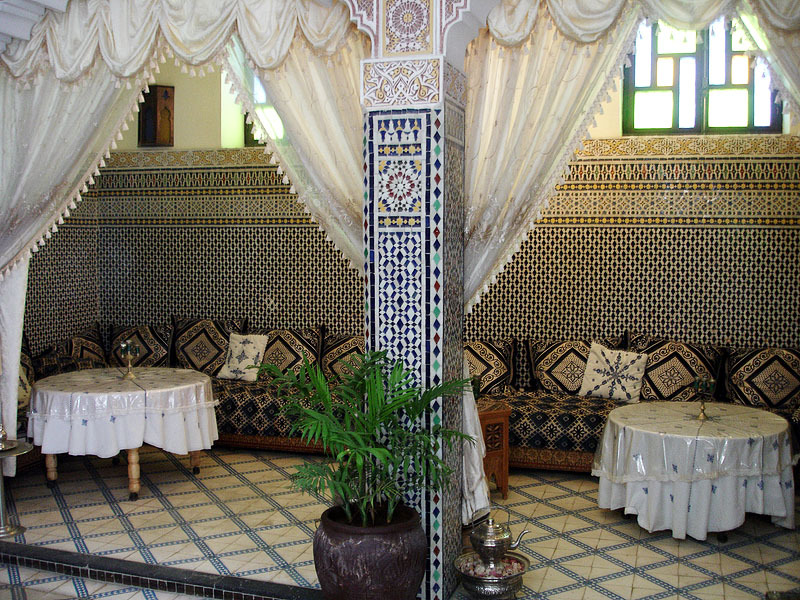 It has been beautifully restored in the elegant Andalucian style with hand made mosaics. 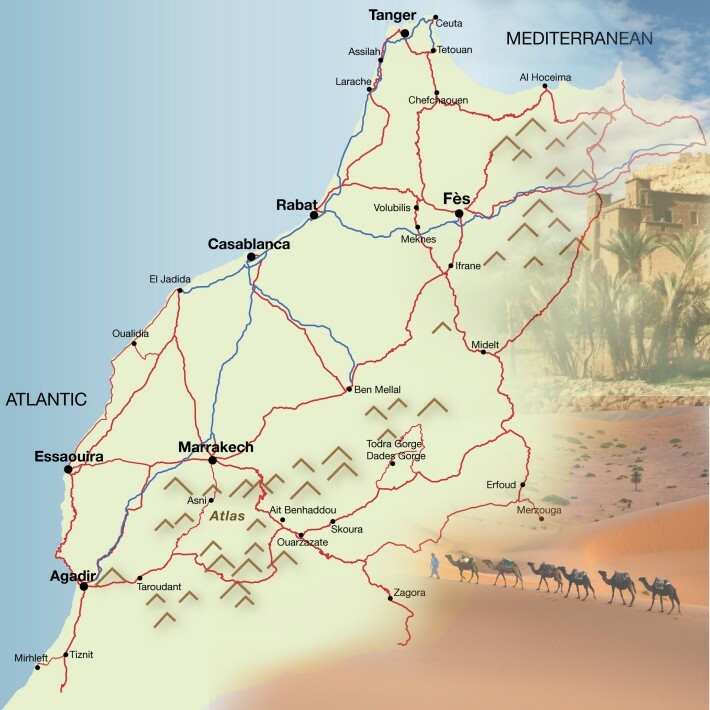 Ideally situated on the edge of the Medina or old town, it is right next to the heart of Meknes where you’ll find the atmosphere, sights, sounds and smells you’d hope to find on your Moroccan adventure. The ancient imperial city of Meknes, known as the Versailles of Morocco, is in Northern Morocco and is one of its most historic, traditional and colourful cities, steeped in folklore and culture. It is 20 minutes away from the historic Roman town of Volubilis with amazing mosaics and remains. 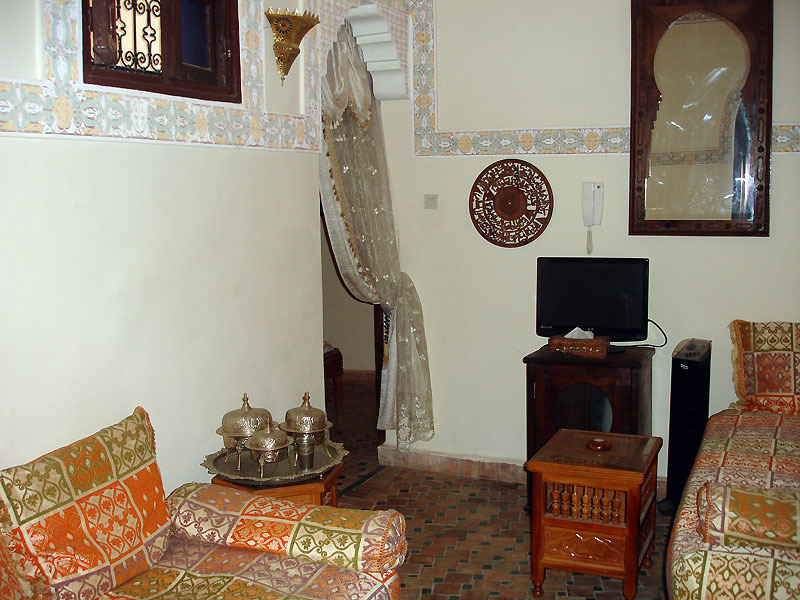 Riad Lahboul also has two apartments available, the “terrace apartment” and the “family apartment” on the first floor. They include two double rooms, a living area and a kitchenette. They are ideal for families or couples travelling together who appreciate a more private atmosphere. The terrace apartment also has access to its own terrace. 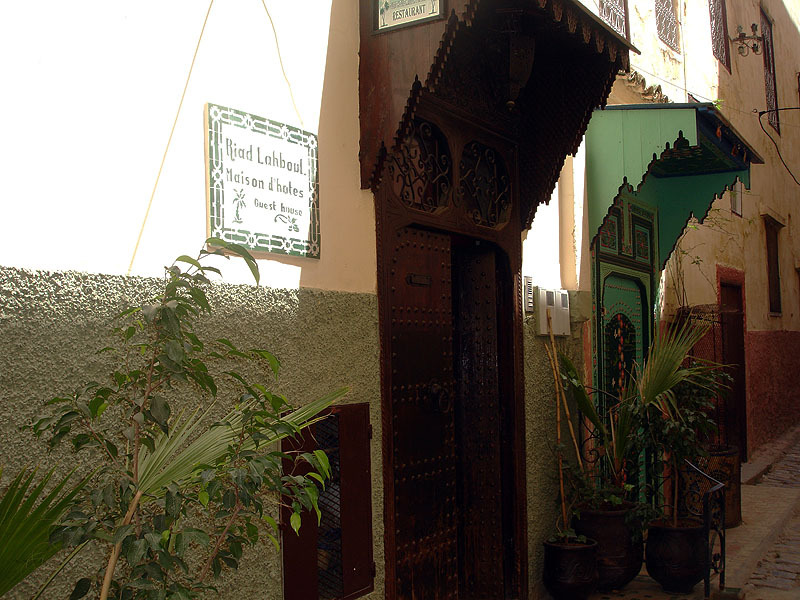 Meals at Riad Lahboul are prepared by the owner Mouna. It is traditional Moroccan home cooking with a twist of French and Indian cooking from here experience of living and working in France and the UK. The restaurant is “table d’hotes” and meals are prepared that day according to what is fresh and in the markets. Mouna also runs very popular cookery courses which include visits to the spice markets and the local wood-fired oven. As Simon and Mouna are both musicians, they also organise Moroccan music and dance workshops for all levels of experience. Wine-tasting is also available depending on the time of year, just contact the riad for more information. 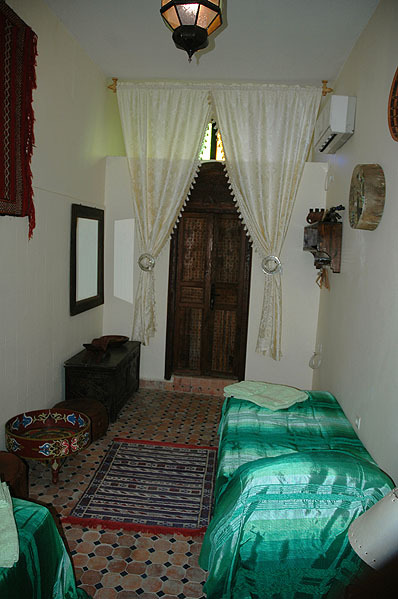 Massage, natural beauty treatments and trips to the hamman next door are available and are very popular as well." 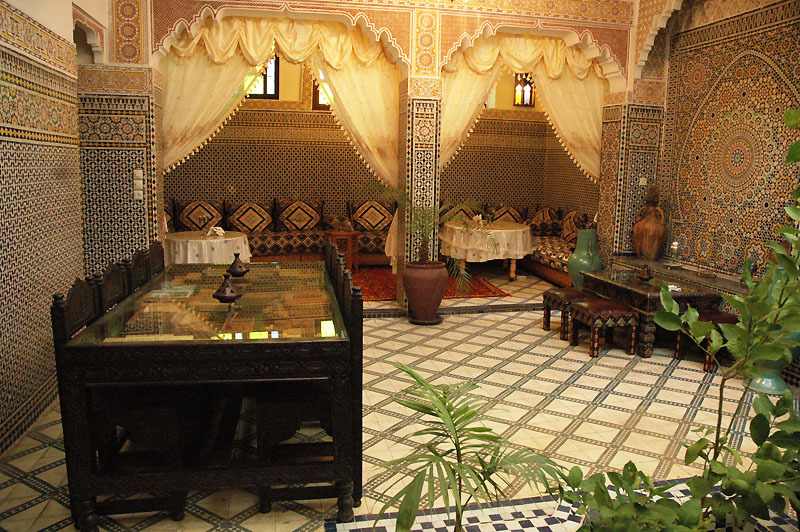 "A lovely Riad made better by the service Simon and Mouna gave us. Not only brilliant service, lovely themed room, great bathroom but above all, excellent food. It was Just what we wanted, old Morocco and tradition food beautifully cooked and presented; more than we could eat." "Congratulations for the hospitality, the food the place and everything! You have been like our family with us. We hope (to) come back soon!" "The owners, Simon and Mouna, have found the perfect compliment to a friendly and welcoming city, by being freindly and welcoming. 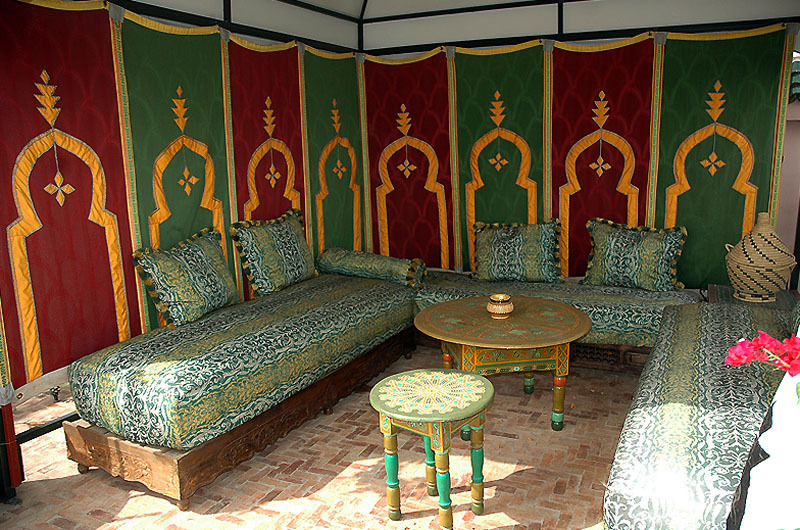 The riad is beautifully designed and decorated, which you could look at for hours, with a luxurious feel to it. 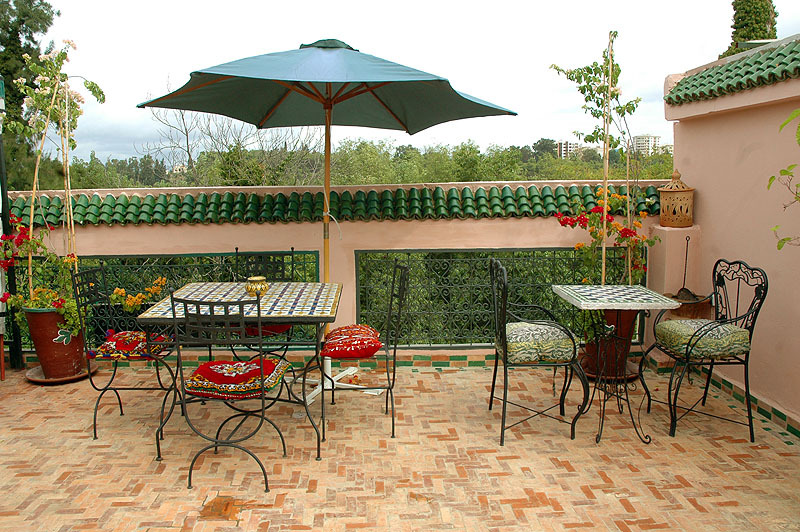 It has a great tiered terrace with a lovely view of the pretty public gardens across the road." "I stayed here for 3 days and loved every minute of it. The Riad is absolutely beautiful with the most intricate and amazing mosaics - the best I've seen in a Riad, and the stay was a home-away-from-home - I really felt comfortable here. The rooms were spacious and clean and Mouna and Simon could not have been more helpful." 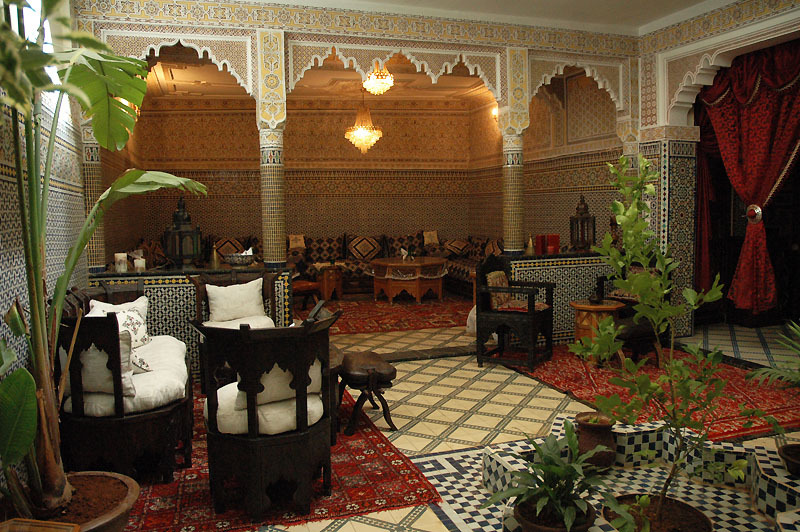 "Riad Lahboul allows one to experience a genuine slice of Moroccan life that is refreshingly far removed from the tawdry hotels that isolate themselves from the heart of Meknes. 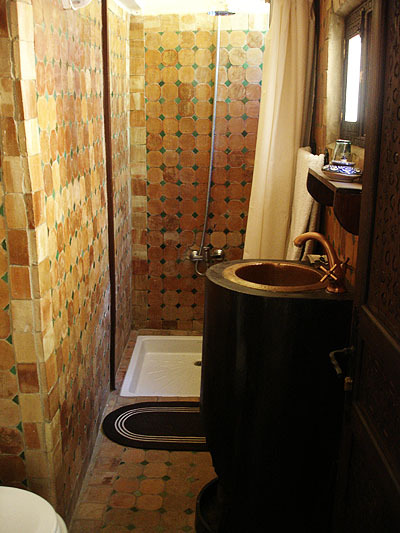 Guests are unhesitantly accepted as if consanguine, a trait which evokes a unique charm and character..."
"We had Riad Lahboul recommended to us by a number of people so decided to head to Meknes and take the cookery course offered and stay the night. We absolutely loved it. Simon and Mouna, who own it were so friendly and easy going and the best I can say is that they are just perfectly suited to hosting guests in this setting." “The iron sculpture room”. An elegant double bedroom with iron sculpture furnishings and decorated with sculpted plaster. This bedroom looks onto the medina street below and has plenty of natural light. It has an adjacent sitting room and can be rented with the “Menstarr” room as a family apartment. It has an en suite bathroom (shower), air conditioning and heating. 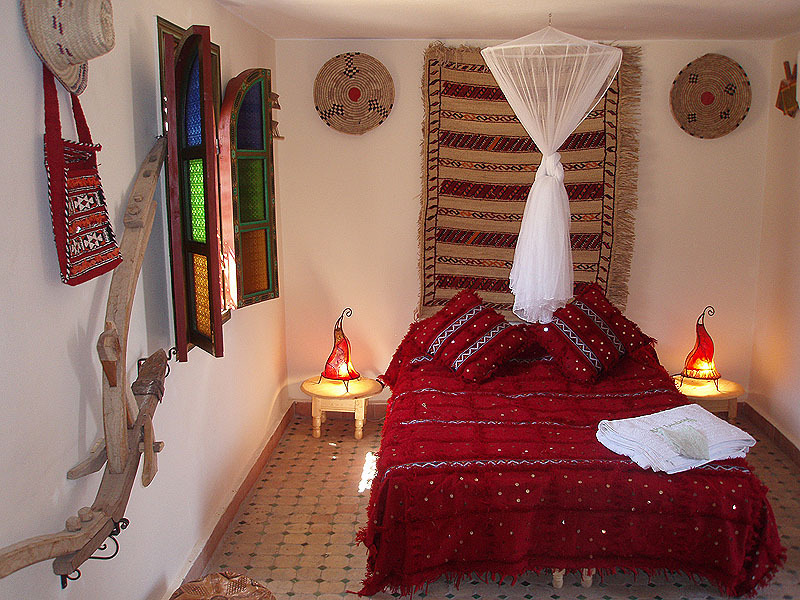 This double bedroom is decorated in the Berber style of the surrounding countryside and features the painted-wood craftwork “Zwork”. As one of the terrace bedrooms it has direct access to the three tiered terrace with its panoramic views and has plenty of natural light. It has an en suite bathroom (shower), air conditioning and heating. This double bedroom features the blue colour of Essaouira in southern Morocco and is decorated in the painted-wood style “Zwork”. As one of the terrace bedrooms it has direct access to the three tiered terrace with its panoramic views and has plenty of natural light. It has an en suite bathroom, air conditioning and heating. The sculpted wood room is a double bedroom decorated with the sculpted wood technique known as “menstarr” as well as sculpted plaster. This bedroom looks down onto the medina street below and has plenty of natural light and space. 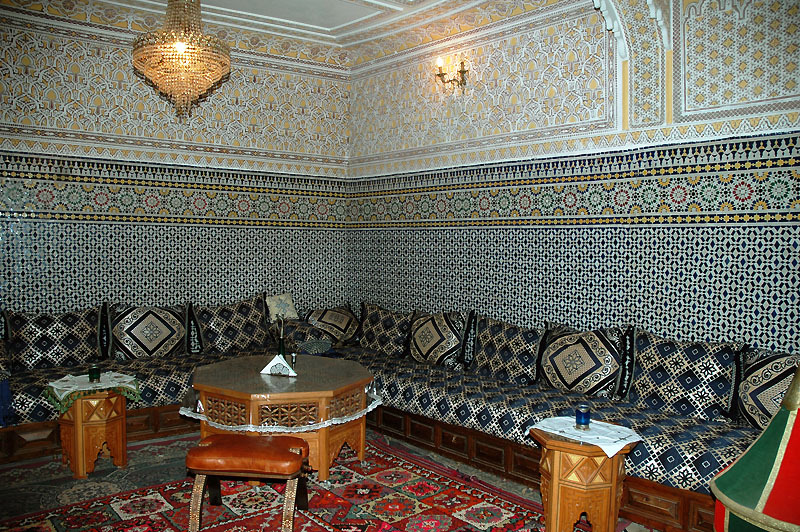 It can also be rented with the “Meknessia” room and adjacent sitting room as a family apartment. It has an en suite bathroom (shower), air conditioning and heating. 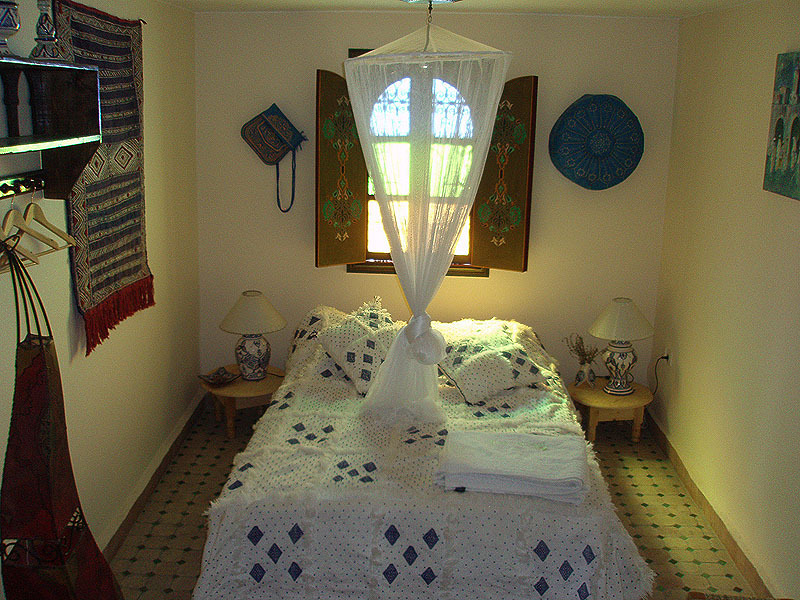 Green is the colour of Meknes and this compact but airy TWIN room features this colour. The room looks down into the ground floor patio and has an en suite bathroom, air conditioning and heating. The countryman’s bedroom is the largest double bedroom. It is decorated in the sculpted wood style of “chleuhowi”. This style is very popular in Meknes and originated as a pastime for the wood sculptors who were “chleu” or from the countryside. 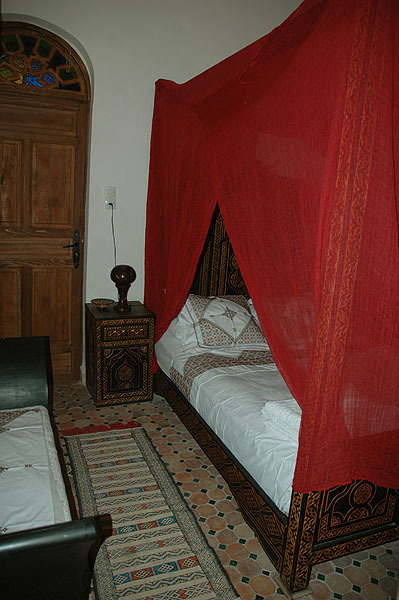 The furniture in this style including the four-poster bed, gives the room its unique style and feel. The room also has plenty of natural light and a feeling of space. It has an en suite bathroom, air conditioning and heating. The bedroom of colours. This double bedroom is decorated in the painted wood style called “Zworc”. The bed in this room is quite low, and not ideal for those with arthritis or aging aches and pains!! 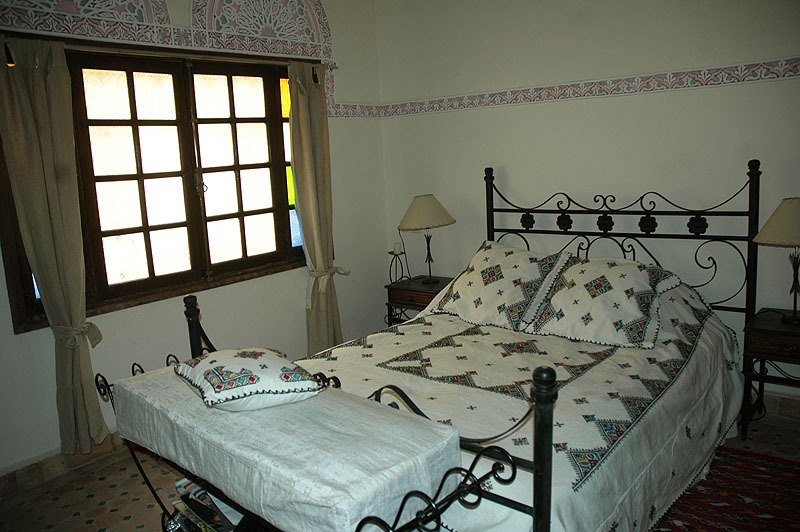 A bright and airy room with lively colours, it has an en suite bathroom, air conditioning and heating. 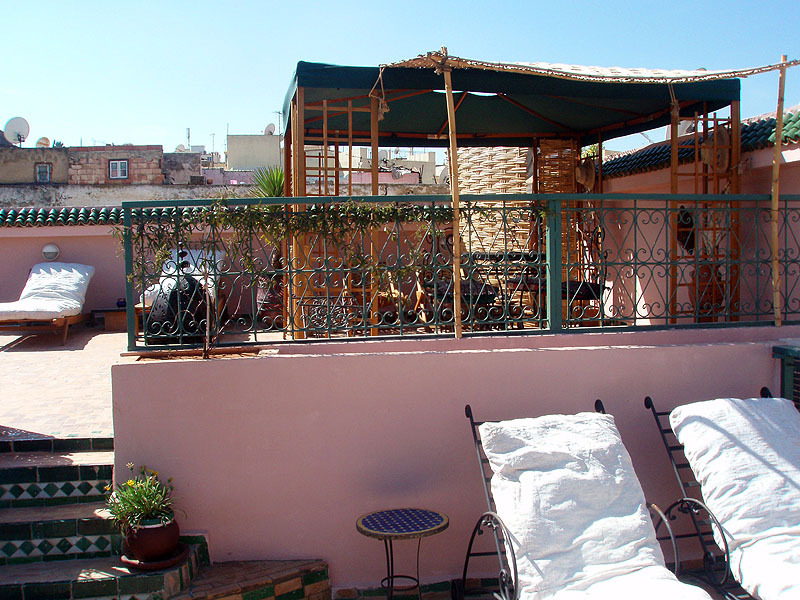 The base rate price at Riad Lahboul is in pounds, euros, or Moroccan dirhams and exchange rates are approximate.